AGM X2 SE has officially been launched by the company and it’s exclusively available on Gearbest right now. 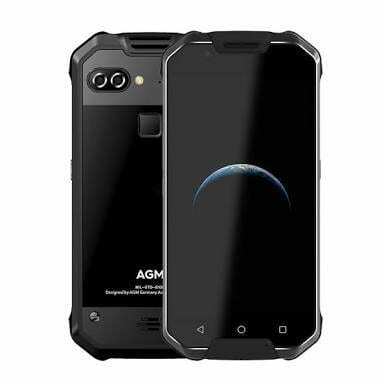 The device is a tweaked version of the AGM X2 smartphone that was released last year. The SE version comes with lots of quality features, boasting of 6000mAh battery, 6GB of RAM, 64GB Storage space and dual rear camera. This might just be a total package for you, if you need a midrange rugged smartphone. What is AGM X2 SE Price and Availability Status? 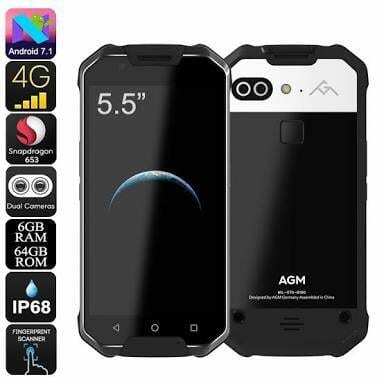 Sports an Aluminium Alloy + Plastic overall mix unibody with IP68 certifications, offering dust and water resistant of up to 30 minutes underwater. The Octagon shaped smartphone is as rugged as they come with strong and durable sides and edges. The dual rear camera sits at the top left with the dual-LED right beside them, before the AGM logo completes the horizontal train. There’s also a rear fingerprint scanner on the device for quick access. As expected, it measures 14mm in thickness and weighs 250g overall. The rugged beauty is available in only Black color. Just like most rugged smartphone, the X2 SE comes with lots of bezels as usual. Nonetheless, its massive screen will make you ignore the bezels, as they also help in protecting the screen. We can see three navigation buttons at the bottom bezel with the normal feature st the top. Moving further, The 5.5-inch FHD AMOLED capacitive touchscreen displays immersive visuals. The screen boasts of 1920 x 1080 pixels in resolution and 401 pixel per inch density, bringing all your movies and games to life. Because of its rugged body, the screen could only stretch up to 59.30% screen to body ratio, while a Corning Gorilla Glass 4 protects it. Working underneath is the Snapdragon 653 MSM8976 chip from Qualcomm with Octa-core processor and 64-bit CPU architecture. The 8-cores of processor on this rugged beauty clocks at 1.95GHz with 28nm process technology. In the graphics department, the Adreno 510 graphics processor from Qualcomm is in charge. The 6GB RAM space on this device has a memory speed of 933MHz and helps multitask through heavy apps with ease. A massive 64GB internal storage space is available and ready to accommodate all your apps and files. Upgrade up to 128GB storage space as the device runs on Android 7.1 Nougat operating system with modified user interface. The dual 12MP + 12MP rear Sony IMX386 Exmor RS CMOS Sensor here has 1.25 micron pixel and captures 4K resolution images. The cameras are equipped with lots of features like IR sensor, Hybrid IR filter, 1.24 um Pixel Size, Phase Detection and others. The 16MP Samsung S5K3P3 ISOCELL Sensor at the top bezel has 1.029 um pixel size and snaps cute selfies. Powering the AGM X2 SE is a 6000mAh non-removable Li-Po battery with fast charging technology. With the fast charging feature, it shouldn’t take up to 3 hours to fully charge up the battery from 0% to 100%. The AGM X2 SE is available on Shopping stores from $399 (N130,000) to $449 (N150,000). Click on the links above to view the latest AGM X2 SE price & availability on Shopping stores.